The first set of school records were set at our recent Junior Sports Day, held this year at the EPSV. 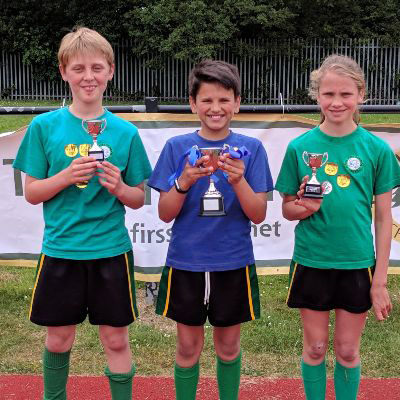 There was a tremendous display of determination, sportsmanship and competitive spirit in both the field and track events, such as, shot put, long jump, 75m sprint and 1000m run. Each student participated in at least two events of their choice. After a few nail-biting moments and a couple of photo-finishes, the day drew to a close with an overall Falcon House win. On the 8th of June, every pupil arrived at Ellesmere Port Sport Village (EPSV). As a tradition, The National Anthem was played while everybody stood in silence. Then everyone (pupils) walked 100 metres while the traditional Banner Man song was played. After the pupils sat down, Year 5 started their field events (Shot put, broad long jump, cricket ball and rounders ball throw and Year 3 started their track events (75m sprint, 150m sprint, 600m). When some people had finished setting loads of brilliant records, Year 5 swapped with Year 6 and Year 6 did their field events. Year 4 did their track events and some very good records were set. After a quick toilet break and some delicious biscuits, Year 5 did their track events (75m sprint, 150m sprint, 600m sprint, and the hardest and most horrible of all – the 1000m)! At the same time, Year 3 did their field events. When Year 4 had finished their events and Year 6 had done theirs, the relay races started. In the Year 3 relay race, Falcons came 1st, in the Year 4 relay race Eagles came 1st, in the Year 5 race Falcons came 1st and finally in the year 6 relay race, Hawks came 1st!!! Overall FALCONS came first winning the house trophy! Well done Falcons. Reported by Oliver M, Year 5 (SSOC). Visit our Sports page here. fundraising events yet to come!